The Razer Phone has already been crowned the best gaming phone on the market today, and it might need to make room on the mantle for another trophy: the best phone for Netflix. Its Quad HD 120 Hz display makes it a great option to binge Black Mirror on, but the Razer Phone didn't exactly stand out from the rest of the pack until now. 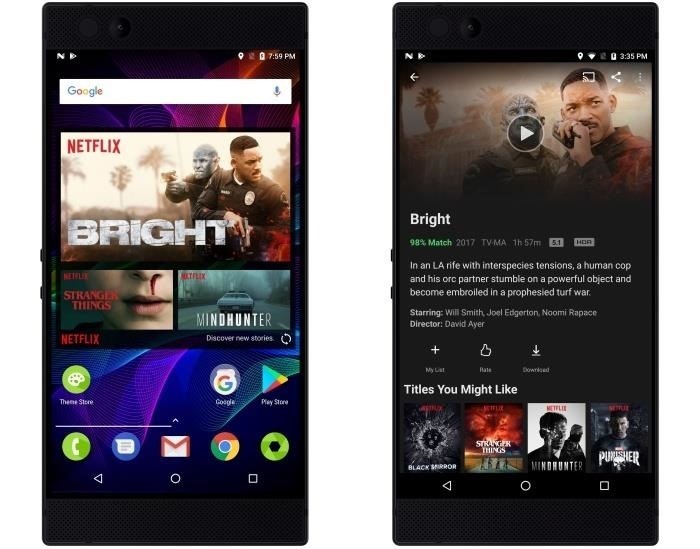 Razer recently announced at CES 2018 that an over-the-air update "this month" will give the Razer Phone Dolby Digital Plus 5.1 and HDR support for Netflix. While supporting HDR isn't revolutionary at this point (Netflix HDR is already included in 5 other Android phones), the inclusion of Dolby Digital Plus 5.1 for Netflix is. With this new audio setting, Razer Phone owners will get five full-bandwidth channels, as well as one low-frequency effects channel, the standard for 5.1 surround sound. While this has been built into some high-end PCs, the Razer Phone will be the first smartphone to feature it. The upgraded sound quality will work with the Razer Phone's external speakers and the THX-certified USB Type-C to 3.5 mm audio adapter. When the Razer Phone gets this update, it might just top the list of our best phones for streaming Netflix, with its 120 Hz refresh rate, front-firing stereo speakers, and these new audio capabilities. While Razer's over-the-air update is free, you'll need to upgrade to the Netflix premium plan in order to take advantage of the added HDR support. The plan will cost you $13.99 per month, but you'll have access to features like HDR, streaming to four devices at once, and Ultra HD. Also coming with the update will be the Razer Phone's first bloatware. Yes, the Netflix app, as well as the home screen widget, will appear on the Razer Phone after the update. But who doesn't love Netflix?